Baby is the size of: Hallie is measuring 2.5 lbs right now (per our ultrasound Monday). 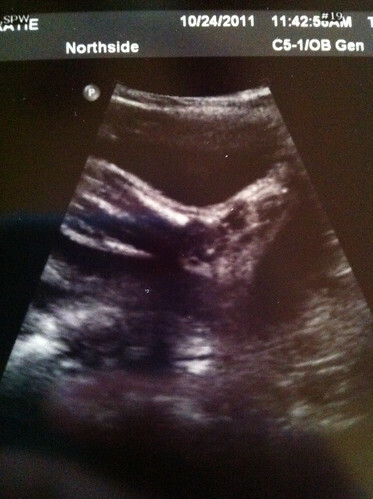 This is still about 2 weeks behind, which was about the same length of time as the last ultrasound. So that is good she's still keeping on her own curve. Sleep: I love sleep and glad I'm sleeping well. Getting comfy is hard at first, but I fall asleep relatively fast. Fun moment(s) this past week: The girls' birthday party was a blast!! The weather was perfect and it was so great to see everyone. I just love my aunt's place - it's just the perfect party place and she is so so so generous in letting us always use it. Yesterday was fun. It was mine & Chris' 14 year dating anniversary! We had a Waffle House breakfast together, went to our 2 appts, then had lunch and yogurt together. Just he & I. My love tank was full!!! Movement: Oh my goodness! This week went to a whole new level!! I think I actually felt her flip from breech to head down last Tuesday. I was in the middle of drinking chocolate milk and had my head tilted back. All of a sudden, I felt like she was about to reach up out of me! It was crazy. I didn't think about the fact that it was probably her flipping until at the ultrasound we learned that she had moved to that position. Now, I get all kinds of kicks on my right side and under my ribs. She is strong! 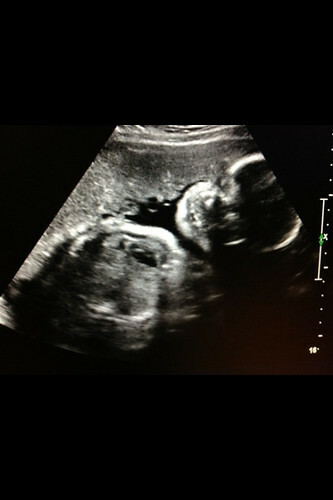 What I am looking forward to: We've had a friend give us a 3D/4D ultrasound. I think we may do that next week! This will be very cool to share with the girls. Reflections on the past week: I feel like I could write forever on this one. Tears can come at a drop of a dime - out of no where - and then be gone again 10 min later. But overall, I have felt a huge feeling of just being loved, loved on, and grateful this week. I don't feel alone at all, although I have to go through this, I know that so many of you are going through in with us. You have no idea how much that means. I would love time and the ability to write more on all kinds of feelings I've had this week - I just don't know how to get it all out there! Words don't do my thoughts justice! Prayer requests: We would love to meet Hallie. Would you pray for that specifically? I will pray for your sweet family and wish you all nothing but the best. I am passing your request along. God bless you. I LOVE the new pictures of Hallie, she is beautiful. We are praying for your family. I see Hallie's foot and hand of God. I am on it! So glad to have something specific to pray for. Love you guys! Quinn is also very active and it is such a comfort to feel her all day long. I wish that it never had to stop. That is my one wish as well, that I get to meet my Quinn alive. I will be praying that you get to meet your Hallie as well! A friend of mine who lost her baby at 21 weeks told me that no matter how much time you get with her it will never be enough but you have make it be. I pray that I am able to do just that! Keep being strong, all of our girls need us to be!! Katie, my heart is with you. We have just learned that our son will have a cleft lip--seems to be unilateral and we're not sure if his palate has been affected at this point. Your story and baby girl are very inspiring. I admire your strength and faith and pray to God he gives me the same. Merry Christmas to you and your beautiful family! Bella & Farrah's Birthday PARTY! Pregnancy Update - 30 weeks! Pregnancy Update - 29 weeks!